With warmer temperatures now sweeping across the country, it looks like the 2011-2012 winter climbing season is finally coming to an end. 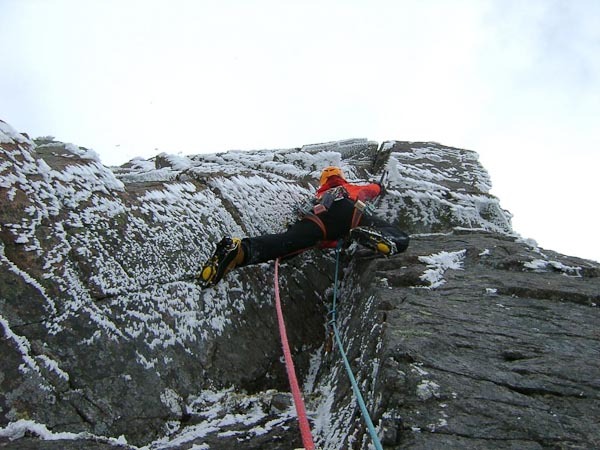 The last six weeks have been unusually cold for the time of year, which has led to resumption of winter climbing, although unfortunately only a handful of folk appear to have taken advantage of it. Unusually, the best of the conditions have occurred in the Cairngorms. Normally it is late season ice on Ben Nevis that attracts attention, but the devastating late February thaw meant there was little snow-ice formation high on the Ben. Instead cold north-easterlies have kept the Cairngorm plateau white with deep snow and the high corries have provided good sport for those willing to get up early and make the long approach. During May, over a dozen new routes have been added to the high corries of Braeriach, Cairn Toul and Ben Macdui. This entry was posted in Repeats, Winter Conditions and tagged Andy Inglis, Ben Macdui, Braeriach, Cairn Toul, Guy Robertson, Northern Corries. Bookmark the permalink.